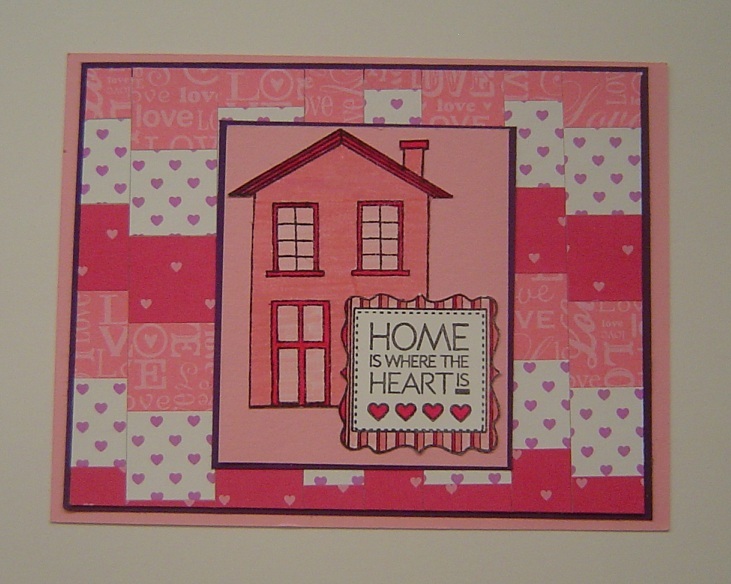 Today's tutorial is another great way to use scraps! Also, we're still celebrating the new Hero Arts stamps, so my sample card today features stamps from the Right at Home (CL583) set. Be sure and watch the S&S blog, Facebook, and this week's OWH tv show for chances to win a set of your own! 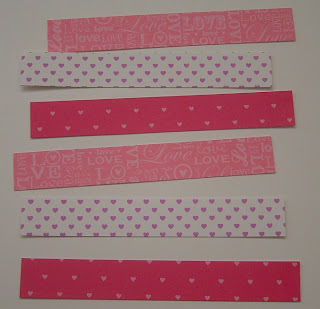 Start with strips of patterned paper. 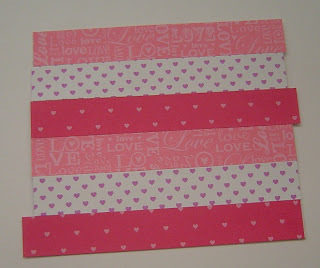 You can use whatever size (width) scraps you have as long as you have enough length to stretch across your background. 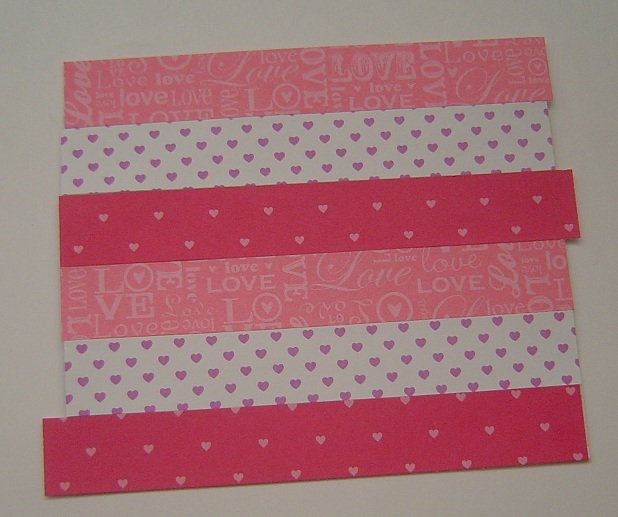 I cut my patterned paper for this card, so I have six strips that are each 3/4" wide. 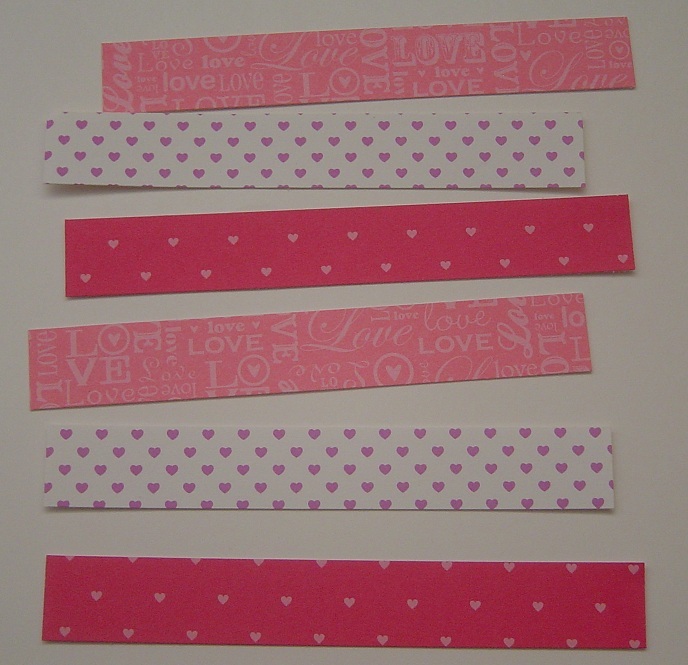 Adhere your strips onto a piece of paper or thin cardstock. You want to use a lot of adhesive because you're going to be cutting these up later. You can use a xyron if you have one. I just used a LOT of ATG. 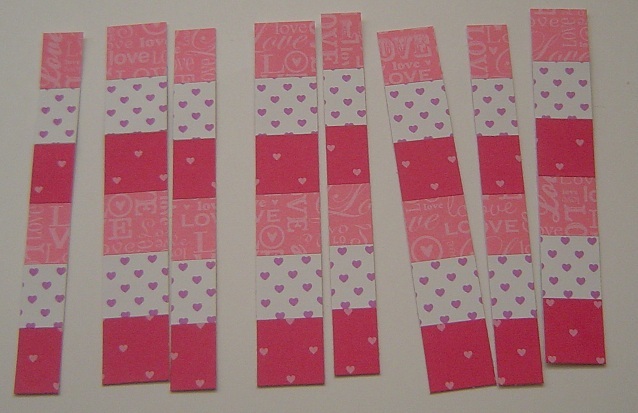 Trim the ends and then cut your paper into strips of different widths going the opposite direction. Mine are alternating 1/2" and 3/4". Stagger the strips and adhere them to another piece of paper or thin cardstock. Here's a video with a different Bargello background. It's in French, but the card is beautiful, and it's definitely worth watching. She makes her own background paper (anyone still working on last week's Throwdown?) and then cuts it into strips and staggers those. It's also a really great example of sponging. Remember, if you have a tutorial idea or a technique you think we should feature, please email me at kate@operationwritehome.org. gorgeous, Kate! Will be trying this later today! Love your background, Kate -- can't wait to try this! As to the French card, all I can say is "tres jolie!" (and that's about all the high school French I remember). What a cool way to make the background. Nice technique! 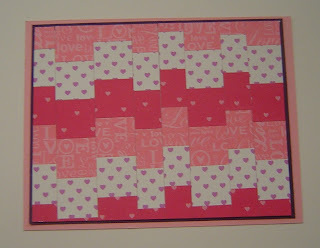 This is totally new to me and I love the "quilted" feeling it gives with the patterns you've used here Kate. 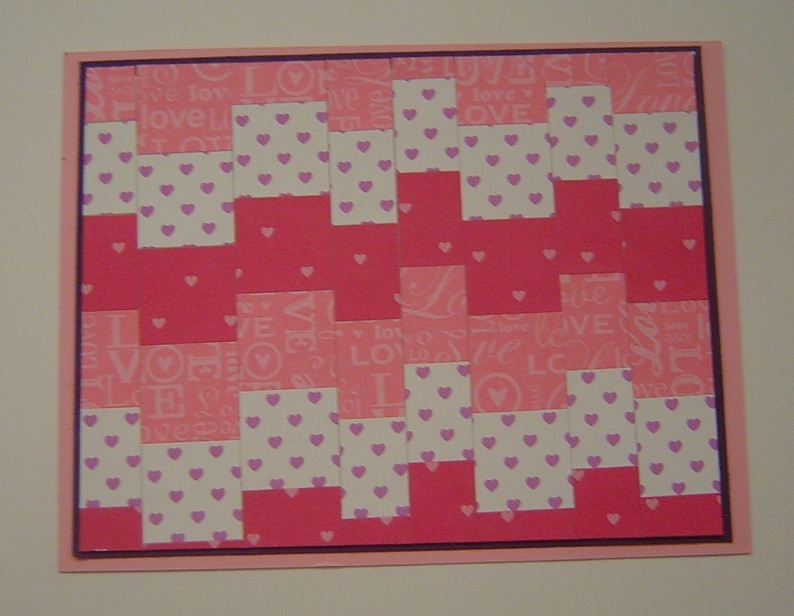 The geometric style would be great for masculine cards too with the right papers. Great Technique!! Love the Lego stamp-a-ma-gig in the French video! Going to have to try that one! Lovely card. I've done this technique using paint chips. It makes for a vibrant background and is fun to do. I'll be pulling this technique off my "do it again" list. Thanks, as always, for sharing. Love this technique and your background. Cannot wait try. I have lots of scraps. Inspirational! will have to try this technique, love LEGO as a stamp positioner, finally a good reason to save scrap pieces! Always happy to see a good way to use scraps! Love this technique & can hardly wait to try it and get rid of some of these scraps. Thank you for sharing this. As others have said, this is a great way to use up scraps and in an innovative way! Cool! I've never seen anything like it and will definitely have to give it a try. Thanks so much! Great technique and the French video is a hoot. "Bar-a-jello." Thanks for a fun new tutorial! I'm happy to have ordered my new Hero Arts Stamps and can't wait to have them! 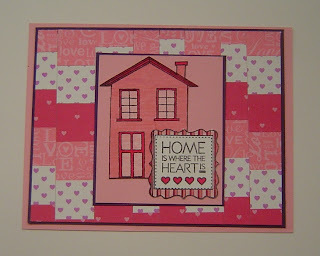 I did buy two sets at my LSS on Tuesday, and my order from Simon Says Stamps should be here SOON! Yippee!! Have a great week! !